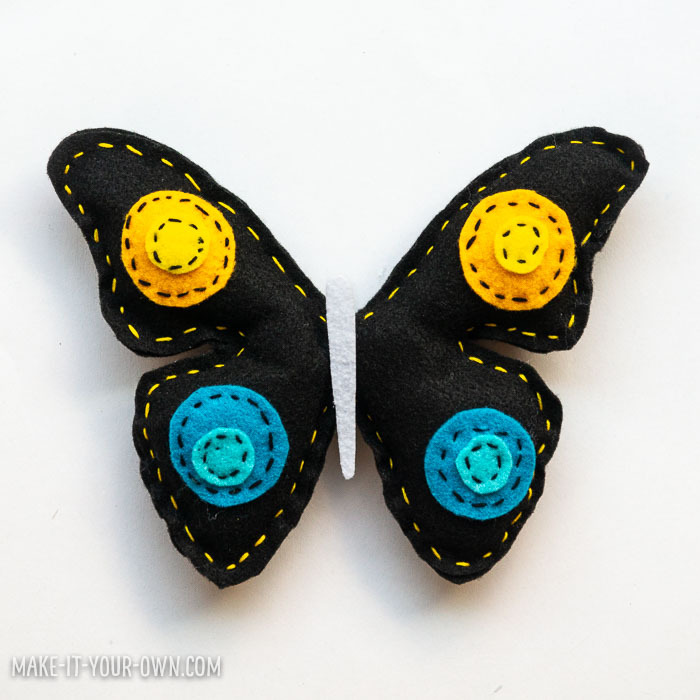 We were delighted to participate again this year with a butterfly that you can personalize with your own design! 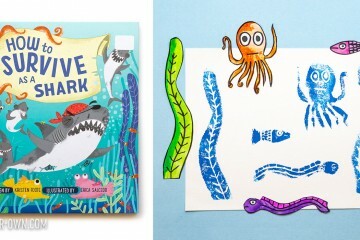 Print the template or better yet- design your own! Cut it out. 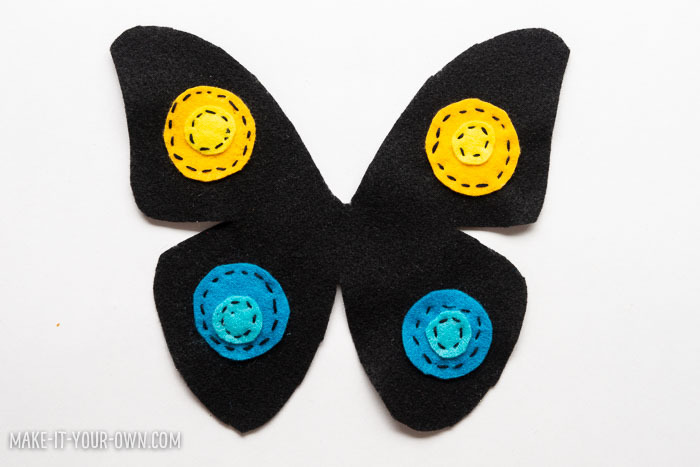 Form a tape donut and tape it to your felt to cut out two copies of the butterfly wings and one butterfly body. 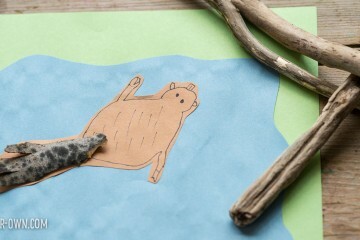 You can trace around it lightly with a pencil, fabric marker etc. if that makes it easier. 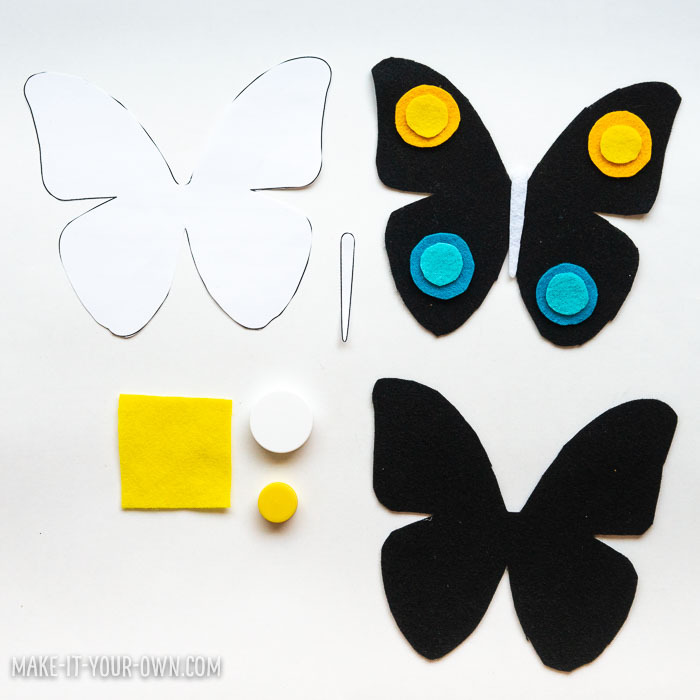 Cut out shapes for the designs of the wings. 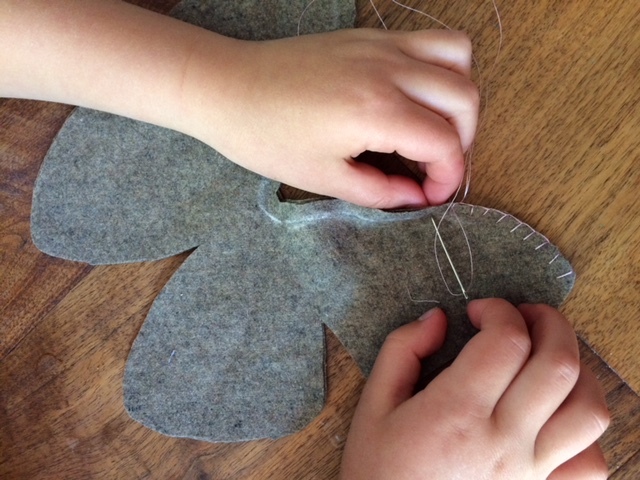 We went with something simple, using two different sizes of lids to form circles to decorate the butterfly’s wings. 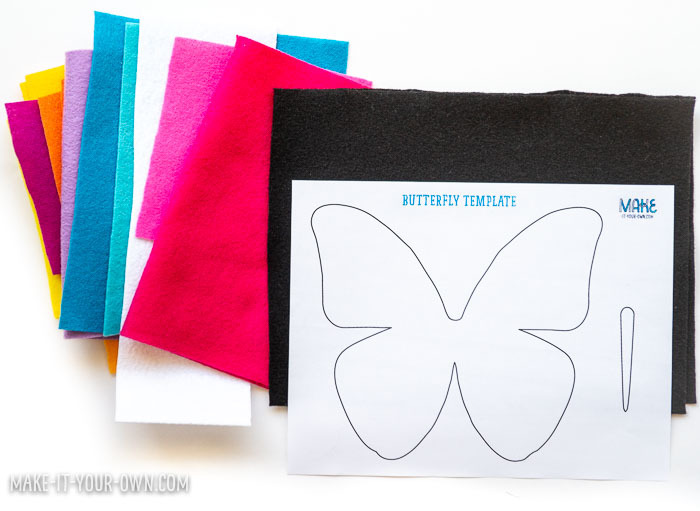 Sew these shapes onto one of the copies of your butterfly wings. 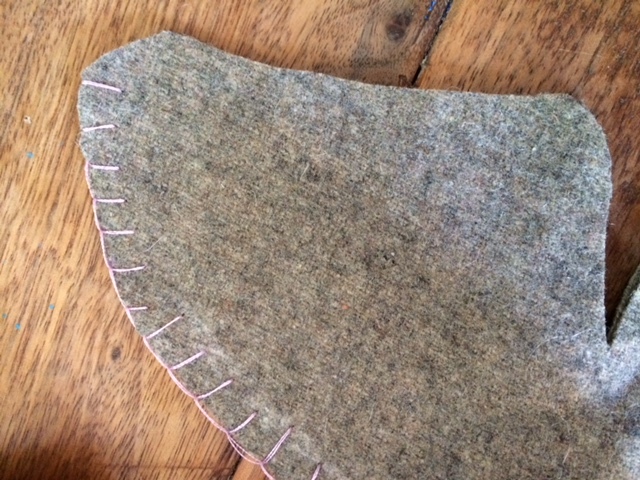 As you can see we went with a very basic running stitch, but our cousin went with a more complex blanket stitch in her project below! 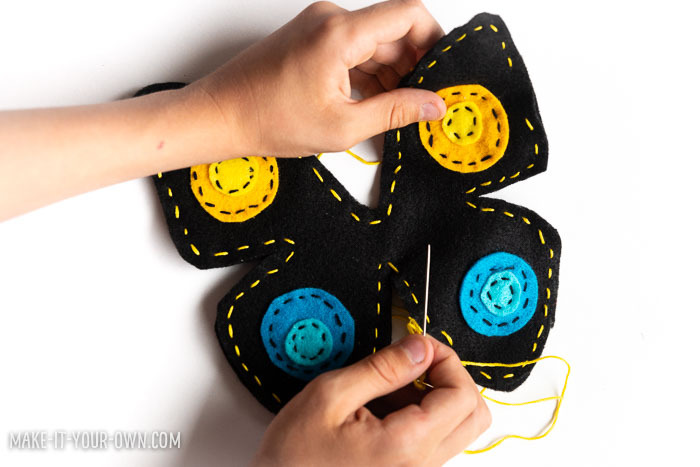 Lay the two copies of the butterfly wings on top of each other, assuring that they align and then sew around the edge, making sure that you have a slight border. Leave a gap so you can stuff your butterfly. Gently fill your butterfly. 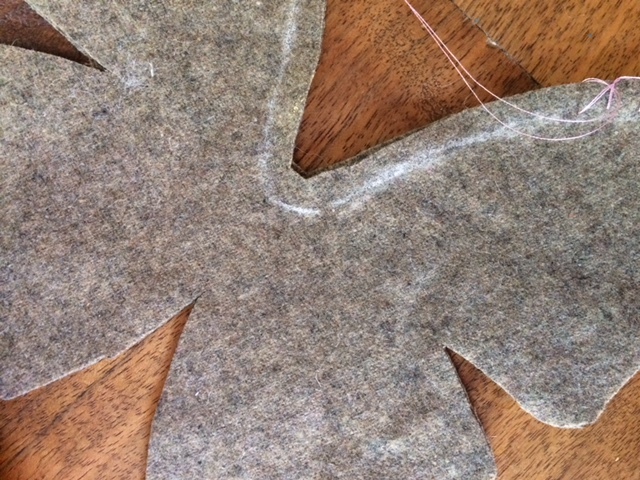 If you find that you are having a hard time getting the stuffing to the corners, we find using a chopstick to gently guide it further in does the trick! 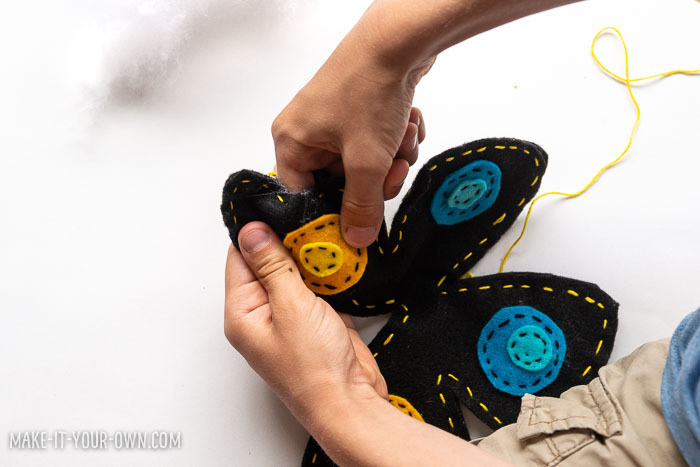 Glue your body on and give your butterfly to a friend to snuggle! Wouldn’t this be perfect for someone who is about to go through a new transition, such as moving to a new city? A butterfly symbolizes the beauty that can lie in change. Part of Sew a Softie is teaching someone else to sew one too! 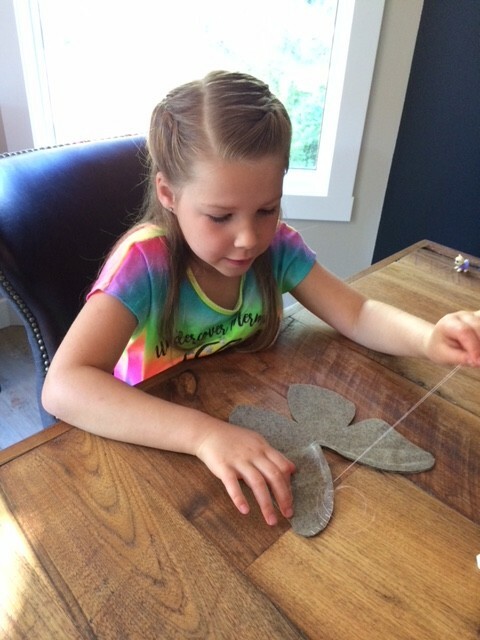 Here’s our cousin sewing her own butterfly. 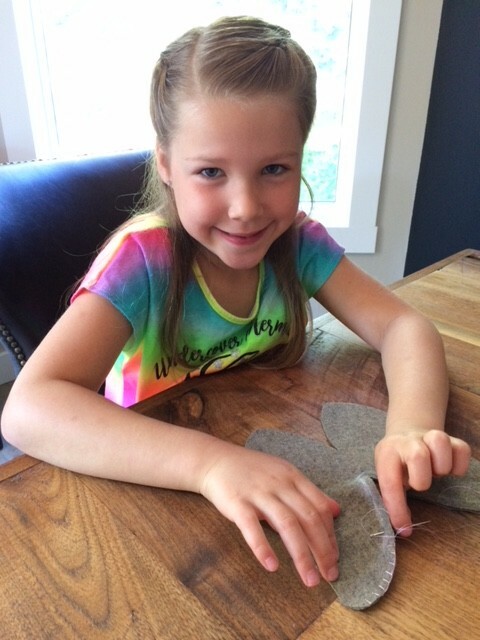 The beauty of working with other people is that my sister knows quite a bit more about sewing than I do, so really we learned so much from her in the process- like using the fabric pencil to create the easy line for the border. 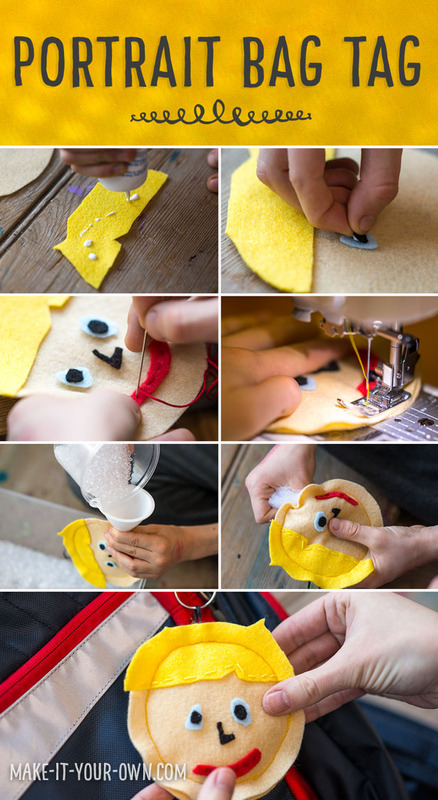 Here’s last year’s project: A personalized bag tag to look just like you! Use scissors and a needle with care and direct, adult supervision. Cord, yarn, floss etc. can be a strangulation hazard, therefore be sure to use with direct supervision and for its intended purpose. Small items can be a choking hazard, therefore be sure to keep them out of the reach of children ages 0-3 years of age or those that tend to put things into their mouths. Love your butterfly Bonnie and I thought the idea of giving it to someone who is going through a transition! And I love how can you learn so much when you teach someone else…even if they don’t know more about the subject! 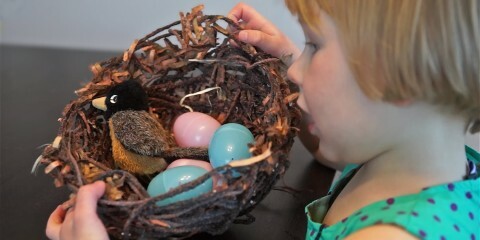 Thanks again to all your family for joining into Sew a Softie. Thank you! 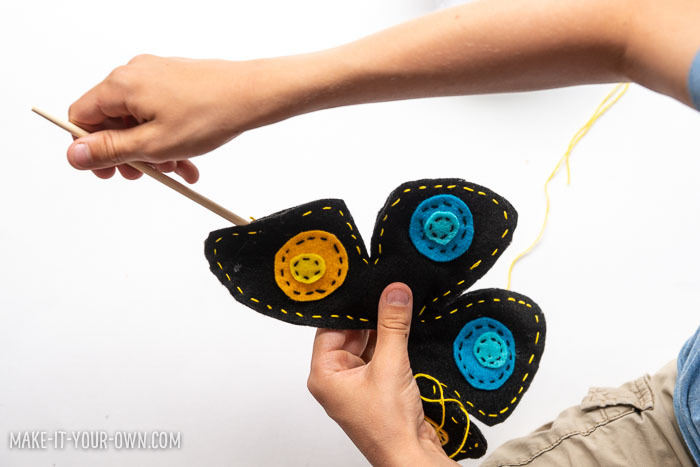 It has been a year of butterflies for the kids- they have had several projects with them and who can resist the magic of their story! ?